The doctors diagnosed myalgic encephalomyelitis, ME for short, also known as Chronic Fatigue Syndrome – a debilitating illness affecting the nervous and immune systems. Zoe missed a lot of school but was able to continue with her studies with the help of an online tutor. But “over the years her real-world friendships disappeared because she’s not well enough to see anybody,” says Ms Johnson. For the last three months, though, she has been taking classes alongside her former classmates using a “telepresence” robot called AV1. 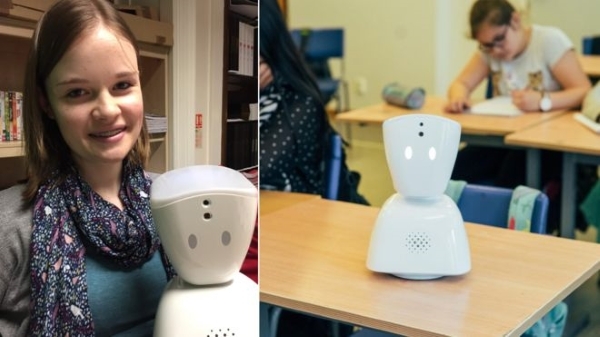 The small, cute-looking robot, made by Oslo-based start-up No Isolation, sits in the classroom and live streams video and audio back to Zoe’s tablet or smartphone at home. She can speak through the robot and take part in lessons, also controlling where AV1 is looking. When she wants to ask a question the robot’s head starts blinking on and off to alert the teacher. And when she’s too tired or sick to participate she can turn AV1’s head blue as a signal. “It makes my life a lot more exciting and makes me feel like I haven’t been forgotten,” Zoe says. With the robot’s help she was able to take five GCSE exams this year. “We’re celebrating because she did so much better than we ever dared hope,” says Ms Johnson. Zoe is going on to study History A-level and is looking forward to doing so “with my friends, rather than on my own at home”. Karen Dolva, the 27-year old Norwegian co-founder of No Isolation, says a friend working as a nurse in a children’s ward “mentioned these kids were miserable and only seeing their families,” she says. She and two friends – all three with a background in engineering and technology – talked to the children and discovered that smartphones and messaging apps weren’t enough to address their feelings of isolation. “We realised the kids needed to have a presence somewhere they weren’t,” says Ms Dolva. But the children also said they felt “more comfortable when they didn’t have to be on display”. So although AV1 enables children to see and hear what’s going on in the classroom, other children can only hear her voice through the robot’s speaker. Other telepresence robots feature two-way video. While many once-deadly conditions are now treatable, it has meant more people living with chronic illnesses, often feeling isolated as a result. In 1960, 1.8% of children in the US had a health condition severe enough to interfere with their usual daily activities. By 2010, this was more than 8%, according to a study in the Journal of the American Medical Association. So telepresence robots are growing rapidly in popularity, with No Isolation, the makers of AV1, being joined by the likes of Ohmnilabs, Giraff Technologies, Double Robotics, and Vecna. Robot market analyst Lian Jye Su, at ABI Research, believes the market for telepresence robots will grow from $164m (£126m) to $237m by 2023. But they’re not cheap – AV1 costs £2,200 or £167 a month to rent, while Ohmnilabs’ Ohmni robot costs from £1,150. “You can’t cure absence except through presence,” says Megan Gilmour, a mother of three in Canberra, Australia, who has been campaigning for the introduction of such robots in schools. In 2010, her son Darcy was diagnosed with a rare blood disorder necessitating a bone marrow transplant. He missed two years of school. So in 2012, she started an organisation called Missing School, with two other Australian mothers whose sons had critical illnesses. “If you ask children what they think of the robots, every single time they say it helps them see their friends,” says Ms Gilmour. Telepresence robots are also helping combat the loneliness and isolation often felt by older people living alone or stuck in hospital. Dor Skuler, chief executive of Intuition Robotics in Tel Aviv, has developed a robot designed to be a stimulating companion for older people. ElliQ is an artificially intelligent robot Mr Skuler describes as “a sidekick of sorts that suggests things for you to do: ‘Hey, it’s really nice out, why don’t you stop watching television and go for a walk? Or listen to an opera together, or watch a TED talk’,” he says. The ability to surprise users is key, Mr Skuler believes. No Isolation has also designed a device for older people called Komp. It helps family members send pictures, text and video messages to older relatives. The fact that three-quarters of people aged 75 or over are not on the internet is “quite insane”, says Ms Dolva. With just one button and a TV-sized screen Komp is easy to operate and doesn’t require usernames or passwords. Family members use an app to share content which is uploaded as soon as the machine is switched on. But a key challenge for these telepresence robots is connectivity, says Veronica Ahumada Newhart, who studies them for her doctorate at the University of California at Irvine. Schools are built of durable materials, bricks and cinder blocks, which tend to block wi-fi and mobile signals. Users often complain about losing the connection during a lesson. “They’re in the class, doing their stuff, and they get disconnected – then they aren’t really there, because class is going on without you,” says Ms Newhart. Ms Dolva says her company is working to prioritise sound over pictures, if the bandwidth drops or fades out.